Eric Alter, Peter Carlaftes,Steve Dalachinsy, Thomas Fucaloro,Puma Perl, Fred Simpson, George Wallace, Aimee Herman (with Pancetta the ukelele), Matthew Hubert, and Jane Lecroy. 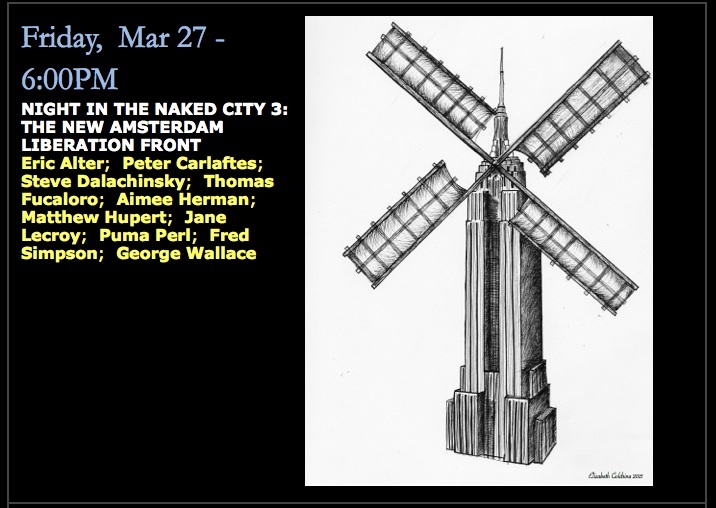 This entry was posted in SHOWS | video, WRITING | rambles and tagged "aimee herman", Aimee Herman (with Pancetta the ukelele), Cornelia Street Cafe, Eric Alter, Fred Simpson, George Wallace, Jane LeCroy, Matthew Hubert, Night in the Naked City, NYC literary readings, NYC poetry readings, Peter Carlaftes, poetry and music, Puma Perl, Steve Dalachinsy, Thomas Fucaloro. Bookmark the permalink.